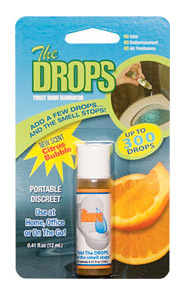 A portable and discreet odor eliminator designed to stop foul toilet odor before it enters the air. 12(ml) Bottles and in 3(ml) convenient travel sizes! Watch the Drops Video Click Here Now! Add 2-3 drops to toilet bowl water immediately before use to create a barrier that traps the smell before it enters the air while releasing a fresh and clean scent. Decrease the number of drops if the fragrance is too strong; increase the number of drops if the odor continues. Eliminate the odor before it starts! 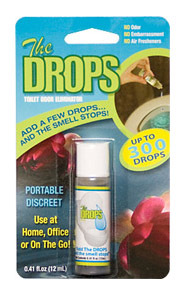 The Drops can be used at home, office, RV's, boats, hospitals, nursing homes, public restrooms...any where there is a toilet!